Argentina's anti-abortion forces won this battle. But the feminist "green wave" will have the war. The Argentine Senate voted down the Law of Voluntary Pregnancy Interruption (IVE), which would have legalized abortion, early on Thursday by thirty-eight votes to thirty-one. The Catholic Church and the bigoted right celebrated, but theirs is a Pyrrhic victory. During the seventeen hours that the Senate debate dragged on, hundreds of thousands overflowed the streets around Congress, defying cold wind and incessant rain to demonstrate their support for the bill. The crowds showed that despite this momentary defeat, the country has been permanently changed. There is no going back from the “green tide,” named for the green handkerchiefs that decorate the wrists, necks, and backpacks of pro-choice demonstrators. Argentina’s undemocratic Senate may delay the legalization of abortion for another year. But the overwhelming social majority that supports legalization has been exposed, with some polls showing up to an 80 percent approval of the IVE law. The day before the Senate debate, a mother of five in the Mendoza province was hospitalized after a back-alley abortion and is still fighting for her life. Three days earlier, a young mother of two died in the province of Santiago del Estero from a general infection caused by an abortion. Over a hundred women die, and up to fifty thousand are hospitalized, each year due to medical complications caused by abortions. However, the legalization of abortion seemed completely out of reach until just a few months ago. The Campaign for Legal, Safe, and Free Abortion, an umbrella group headed by a handful of established independent activists and representatives from left and center-left organizations, has presented the IVE Bill seven times over the last thirteen years. Six times in a row it was shelved by lawmakers. This time was different. It came on the heels of a feminist revolution that has taken Argentina and the world by storm. The proclamation of Pope Francis — an Argentinian — in 2013, and the election of conservative President Mauricio Macri in 2015, seemed to have taken abortion off the table. Then came #NiUnaMenos. The femicide of fourteen-year old Chiara Páez in 2015 prompted a group of women journalists to call for demonstrations against gender violence. An estimated two hundred thousand turned out. Since then, the feminist movement has snowballed and radicalized. Annual protests like International Women’s Day, International Day for the Elimination of Violence Against Women, and Global Day of Action for Legal and Safe Abortion, which used to be small marches of feminist organizations and left-wing parties, began to turn out thousands of people. The annual National Women’s Encounter, a weekend long event of workshops on women’s issues, turned out sixty thousand in Rosario in 2016 —tripling the previous year’s encounter. Earlier that year, on International Women’s Day, women led the first national strike against Macri´s government. This feat was repeated the following two years as part of the International Women´s Strikes, which highlighted the movement’s international character. #NiUnaMenos in Argentina was followed by similar movements against gender violence in Chile, Mexico, Spain, and elsewhere. The International Women´s Strikes coordinated actions in dozens of countries. This year´s struggle for abortion rights in Argentina coincided with to Ireland’s successful referendum to legalize abortion and the second Women’s March and #MeToo movement in the United States. Argentina’s movement has also radicalized significantly. The 2018 #NiUnaMenos march issued a declaration, signed by a broad lineup of left parties and feminist, labor and student organizations, calling the movement “anticapitalist, anti-clerical, and anti-patriarchal.” It also made the demand for legal, safe, and free abortion the headline slogan of the march. Three months before the march, President Macri announced that his party would enable the congressional debate of the IVE Bill. Some mistakenly saw this as a smokescreen maneuver to draw attention away from his administration’s austerity measures, which sparked massive demonstrations in December, and will worsen under the recent agreement with the International Monetary Fund. 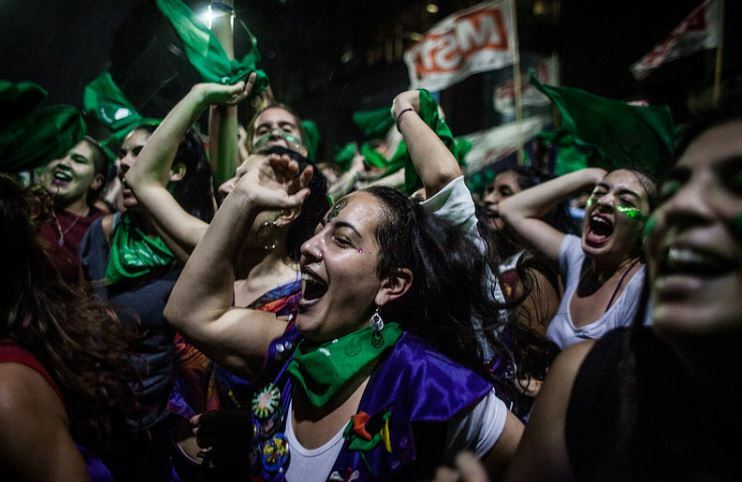 Days after Macri’s announcement, the International Women’s Day march became a sea of green handkerchiefs headed by the slogan for legal, safe, and free abortion. For three months every Tuesday, when the congressional committees met to debate the bill, pañuelazos of thousands of women crowded the doors of Congress. The green handkerchief began to be seen everywhere. In workplaces, classrooms, buses, and trains, streets and plazas, anywhere you looked, you found people showing off their handkerchief. Every program on TV took up the issue, families discussed it over dinner, groups of friends debated it, stories abound of daughters convincing parents to be pro-choice, and teens convincing their groups of friends to go to the marches together. The youth were clearly the main driving force, as could be seen by their massive presence at all the demonstrations. Their predominance helped radicalize the debate, from centering on avoiding deaths to defending women’s right to decide. Just over a week before the Chamber of Deputies — the lower house of Congress — debated the bill, the #NiUnaMenos march flooded the streets of Buenos Aires with 150,000 demonstrators. On the day of the debate, June 13, over a million people filled the streets around Congress. The pressure was evident, and the bill was approved on the morning of the 14th by 129 votes to 125, after two legislators turned around at the last minute and voted in favor. Things would play out differently in the Senate, however. The Catholic Church and the Right, previously confident that the bill wouldn’t pass the Chamber of Deputies, woke up and launched a counteroffensive. They were driven not just to stop the IVE Bill but to defend their privileges. The green tide questioned the billions of pesos the Church receives in state subsidies, and if the IVE Bill passed, the struggle for the separation of church and state would have followed. The Pope himself led the charge, comparing abortion to Nazi eugenics. Then the Church leaned heavily on its networks of influence, exerting pressure on senators in the inner provinces and even on the center-left organizations that participate in the Campaign for Legal, Safe, and Free Abortion. Evangelical congregations staged an anti-abortion march on August 4, making a left response urgent. Yet on August 7, the day before the Senate debate, three of the Campaign’s center-left parties — the Peronist Evita Movement, the Maoist Revolutionary Communist party, and the populist Free of the South — organized a march pressing for other social demands. The Central of Argentine Workers (CTA), a trade union federation with historic ties to the Church, held its national election the very day of the Senate debate, impeding thousands of people from mobilizing to Congress. Unfortunately, the Campaign’s leadership adopted a mistaken triumphalist position, summed up in the slogan “abortion will be law on the 8th.” It placed excessive confidence in parliamentary negotiations, channeling efforts away from the streets and towards lobbying. The demobilizing effect was evident at the Tuesday pañuelazos, which were significantly smaller than before the June 14 vote. Days before the debate, Argentina’s leading newspaper Clarín noted that the Campaign “has lost the streets since the vote in the Chamber of Deputies.” The Campaign leadership also accepted the government´s entreaty to “avoid confrontations” by placing the August 8 demonstration’s main stage a full ten blocks from Congress. Representatives of my organization Juntas y a la Izquierda — a feminist formation in the Socialist Workers Party (MST) — argued for a stronger approach. We proposed to face the Right’s counteroffensive by reinforcing street actions and placing the August 8 demonstration as close as possible to Congress. We lost these debates. It didn’t help that other left groups, particularly those of the Left Worker’s Front, didn’t weigh in on these debates or even participate in the Campaign. Despite these limitations, and a horrible cold and rainy day, hundreds of thousands crowded the streets around Congress on August 8. The blue handkerchiefs representing the anti-choicers did mobilize more than they had on June 13. Yet they were still insignificant compared to the green tide. By night, the pending result was widely known, yet the mood was festive, dominated by the sensation that, though they stopped us this time around, the legalization of abortion has become inevitable. Its realization, however, will depend on drawing conclusions from this year’s struggle, so that we can put up a better fight next year. One conclusion is that the Church and its allies are a formidable opponent. Because Argentina’s state economically supports it, the demand for the separation of Church and state must be central to our struggle. Another conclusion is that the antidemocratic character of institutions like the Senate must be questioned. Provinces of 150,000 people have the same three senators as Buenos Aires, which has fifteen million people, handing disproportionate amounts of power to unrepresentative politicians. But the most important practical conclusion to be drawn is that the only thing that can guarantee our rights is the strength of our mobilization. Our opponents may have won the battle, but we have the war. Celeste Fierro is an activist with Junas y a la Izquierda, a feminist organization in Argentina’s Socialist Workers Party (MST).